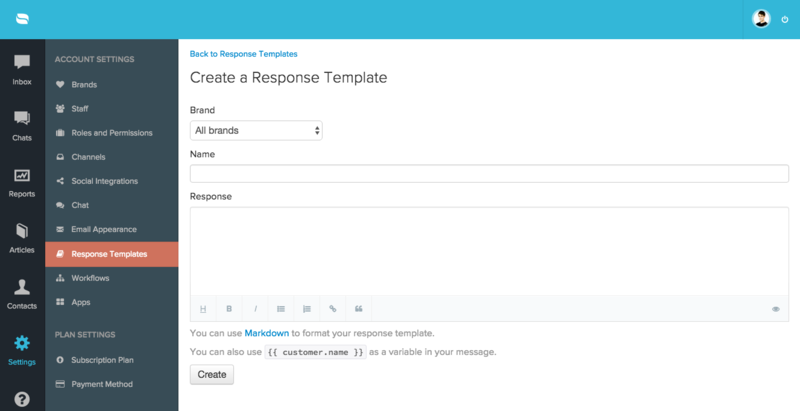 Response templates, also known as canned responses and sometimes as macros, is an efficient way for your support staff to reply to high volume messages. Any staff member can create and edit response templates that are shared across your support team. We recommend using response templates to quickly populate your outgoing message with common replies or answers to recurring questions. To add a response template, click on the "Settings" tab and select "Response Templates" on the left hand side. When prompted, click "Create Response Template". To access your response template while composing new messages, click on the "book" icon right above the composition box to bring up your templates. Select a template and click "OK". This will insert the template into the body of your message for further editing.